With experienced and committed staff, our dedicated employees have installed more than 1,000 systems. Commercial Irrigation & Turf, we put hard work, training and communication at the forefront of all we do. Thus, we have the resources to make your project a success. Efficiency is also one of our goals. Did you know that in most cases, we can install your irrigation system in just a couple of days? Consistency is crucial when you have a sprinkler system. Such a system must be dependable, operating properly whether you’re at home, work or on vacation. As part of our irrigation installation services, we place a big emphasis on quality thanks to 30 years in the industry. 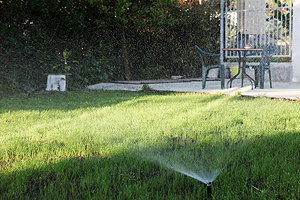 So, for sprinkler systems Champaign IL homeowners crave, choose Commercial Irrigation & Turf. Extensive training for our team ensures that every time you turn on your sprinkler system, you don’t have to worry. There will be no mistakes, leaks, plugs or hassles. Our gift to you is the peace of mind in knowing the installation process is efficient and your project is a success. To do this, we use “trench-less” technology. This allows our irrigation contractors to install your commercial or residential system with minimal excavation and disruption to your routine or property. With the assistance of application-specific tools and machinery, we can easily streamline the installation process. You’ll also be glad to know our sprinkler systems are fully automated via an independent control station. Thus, your sprinkler system can protect your landscape even when you’re not home. We’ll train you on the many options for start times, watering schedules and even rain shut-off capabilities so you can have control over your system. 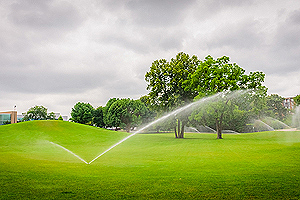 As a distinguished leader in commercial, residential and golf irrigation in Central Illinois, we service all of Champaign, Bloomington, Peoria and surrounding areas. To learn more about sprinkler installation in Champaign IL, call Commercial Turf & Irrigation today at 217-398-1494 or fill out our online form for more information. You will find us in East Peoria at 109 Commercial Drive.